A Memorandum of Cooperation was signed between Mesrop Mashtots Matenadaran and the National Center for Manuscripts and Rare Books of the Republic of Kazakhstan to establish a direct and mutually beneficial cooperation between the two countries in the field of cultural heritage preservation. The Memorandum was signed by Director of the Matenadaran Vahan Ter-Ghevondyan and Director of the National Center for Manuscripts and Rare Books of Kazakhstan Asilkhan Saduov. The Kazakh delegation also included L. N. Gumilyov Eurasian National University’s rector, academician Erlan Sidikov and Ambassador Extraordinary and Plenipotentiary of the Republic of Kazakhstan in Armenia Timur Urazyaev. The Kazakh delegation accompanied by the Director of the Matenadaran made a tour in the Matenadaran. 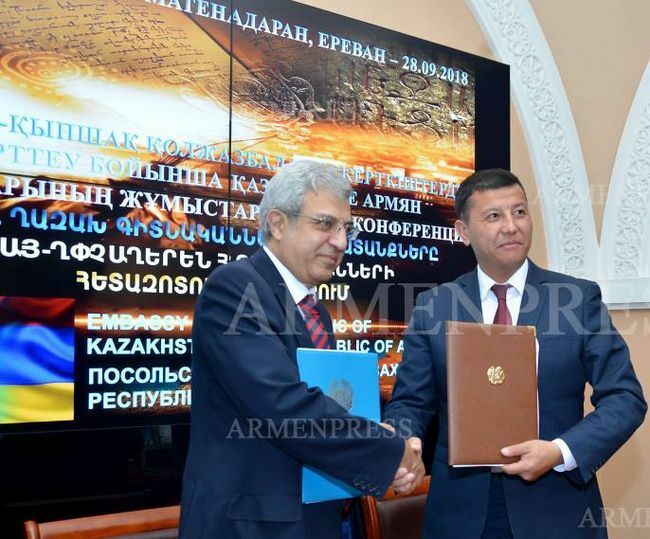 After the signing of the Memorandum of Cooperation, Armenian and Kazakh scholars made presentations on Armenian Ghpchagh manuscripts and related issues.